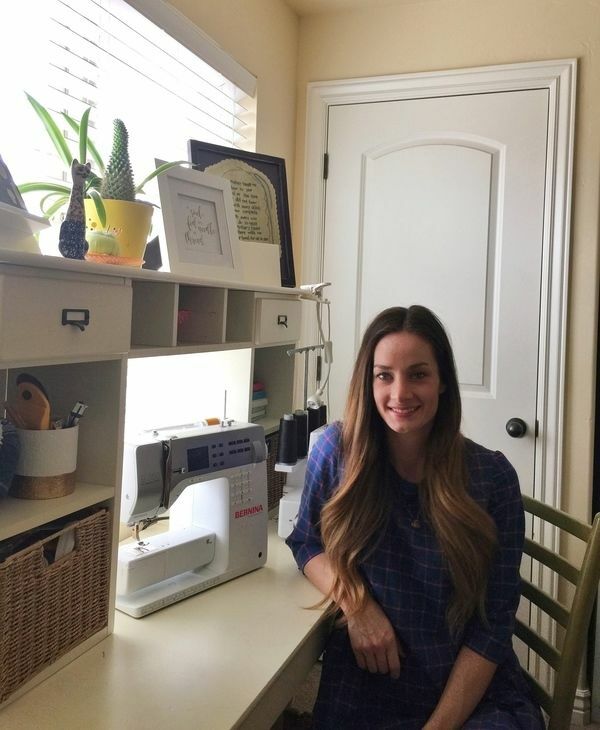 Come behind the scenes at The Sara Project for a #CraftRoomTour and see Sara's sewing room in Salt Lake City. My favorite thing about my space is that it has a door! I have two toddlers so the fact that I can stay up late working on a project, and then leave everything as it is and close the door during the day is a life saver! I live in a three bedroom condo and I turned a little corner of our third bedroom turned office/storage room into my sewing nook. The other half of the room is our "office" (a desk with a printer and desktop). I spend most nights and nap times in this space working on my current sewing projects. Its my little oasis! I love a bright and clean space! I put my desk up against the window and I love the natural light that comes in as I'm sewing (if I'm lucky enough to be sewing during daylight). I've placed special objects on my desk that I love and find aesthetically pleasing. Most of the objects are from loved ones and friends. I keep organized with a DIY chalkboard I made many years ago that hangs on a wall in my little space. I usually have anywhere from 4-15 projects a month so it's a great place to keep track of everything I have going on. I also have a little book shelf where I store most of my fabric on, sewing books, thread (in a cardboard Ikea box), buttons and magazines. I store my patterns and sewing notions in two cardboard boxes I picked up for a few dollars at Ikea. It's nothing spectacular, but I'm so grateful for it. One day we will move and I'll have a whole room to myself! When it comes to sewing, I find it convenient to have my main sewing tools nearby, so these are stored in a little basket that fits into the hutch on my desk. It holds things like my measuring tape, scissors, sewing needle, etc. I also have a clay cup that holds chalk markers, rotary cutter, awl, seam rippers, things I use for most projects. I keep all my sewing machine accessories in a little red bowl above my sewing machine, it's handy when I need to switch feet or bobbins while sewing. I really love my fabric! I usually keep usable sized scraps when I'm finished with a project and it's so fun to look through them from time to time and remember all the projects I've made with them. I usually hang works in progress or finished garments ready to photograph from the books on my book shelf, it's fun to display these projects as they come to life. After I photograph them, they go straight to my closet! I find a lot of inspiration on the internet, and store them on Pinterest. I also like to look through magazines, and usually use the digital copy to save space. Sometimes I'll tape things I'm inspired by around my chalk board! Everywhere! Instagram, Pinterest, the internet, magazines, the runway, movies, and even people I see while out and about. It's all around us! 1. A whole room of my own with white walls and a bright rug! 3. Storage cupboards for all my fabric! Whose craft room would you love to explore? Send us a message!